1. Show top bar widget menu ? Enable or disable top bar widget area. 2. Show top bar on mobile devices? 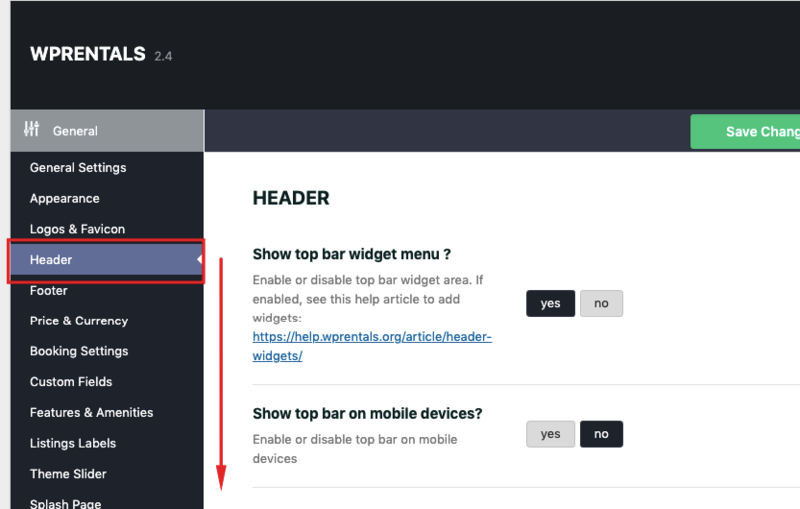 Enable or disable top bar on mobile devices. 3. Show submit listing button in header? 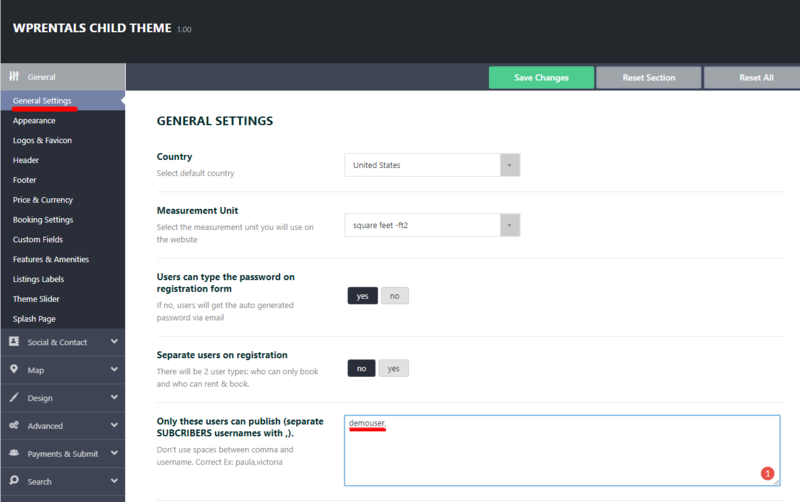 Submit listing will only work with theme register/login. This option removes this button. 4. Show user login menu in header? Enable or disable the user login / register in header. 5. Show the header menu in user dashboard pages? 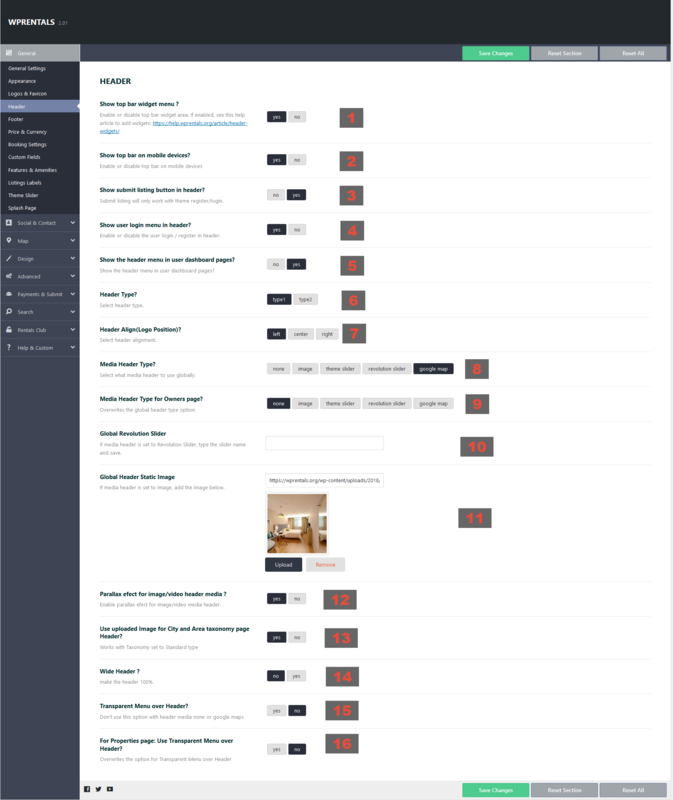 The theme comes with 2 header styles. You can choose between diverse logo positions (right, left, or center). 9. Media Header Type for Owners page? If media header is set to Revolution Slider, type the slider name and save. If you select Google Maps as a global header, the maps options are modified in Theme Options – Google Maps Settings: default latitude and longitude set map default location, default zoom sets map default zoom. NOTE 1: Properties pages are excluded. This custom post has a predefined design. NOTE 2: Half map design doesn’t have a custom header. BUT half map pages/design need header set to Google Maps. Note 3: Properties categories (taxonomies) can have as header a custom image (you upload from edit category) or google maps. 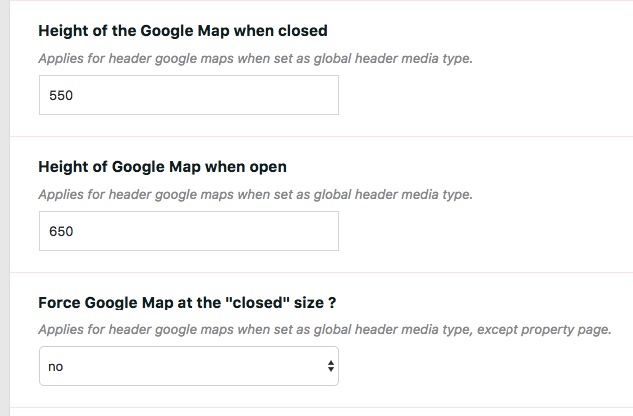 If you select Google Maps as global header, the maps options are modified in Theme Options – Google Maps Settings: default latitude and longitude set map default location, default zoom sets map default zoom. You can enable or disable parallax efect for all headers with image or video media header option. 13. 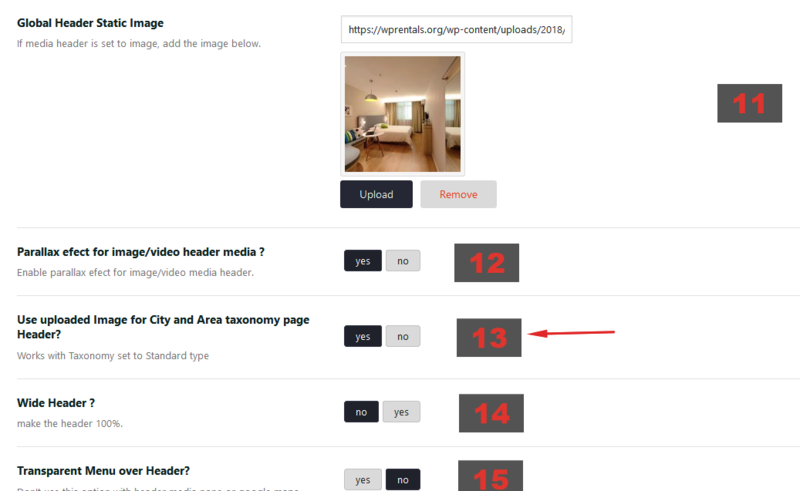 Use uploaded Image for City and Area taxonomy page Header? Works with Taxonomy set to Standard type. You can make the header 100%. 15. Transparent Menu over Header? 16. For Properties page: Use Transparent Menu over Header? Overwrites the option for Transparent Menu over Header.